Photoshop class and decided that I needed to take a break. and picked out a bright palette to play with. 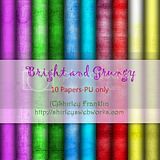 So the idea of some bright, grungy papers was born! Leave some love if you download-it keeps me wanting to make more!